In the year 10191, a spice called melange is the most valuable substance known in the universe, and its only source is the desert planet Arrakis. A royal decree awards Arrakis to Duke Leto Atreides and ousts his bitter enemies, the Harkonnens. 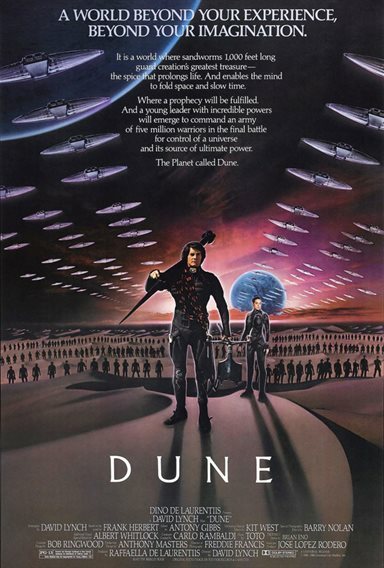 However, when the Harkonnens violently seize back their fiefdom, it is up to Paul (Kyle MacLachlan), Leto's son, to lead the Fremen, the natives of Arrakis, in a battle for control of the planet and its spice. Based on Frank Herbert's epic novel. Download Dune in Digital HD from the iTunes store. Dune images are © Universal Pictures. All Rights Reserved.